FACT CHECK: Did President Trump Fail to Place His Hand Over His Heart During George H.W. Bush's Funeral? Did President Trump Fail to Place His Hand Over His Heart During George H.W. Bush’s Funeral? 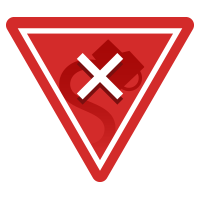 Selective and misleading images of President Trump at George H.W. Bush's funeral went viral with critics. President Trump failed to place his hand over his heart during George H.W. Bush's funeral. Images show President Trump with his hands at his side during President George H.W. Bush's funeral while other government officials and civilians had their hands placed over their hearts. President Trump did have his hand over his heart as the casket passed his pew; President Trump did have his hand over his heart as the casket was carried out of the cathedral; President Trump wasn't the only person who was pictured with his hands at his sides during the procession; placing one's hand over the heart is a voluntary sign of respect and not a mandatory gesture. As former President George H.W. Bush’s casket was carried into the Washington National Cathedral for his state funeral on 5 December 2018, many of the attendees, including former presidents, family members, and lawmakers, placed their hands over their hearts as a sign of respect for the 41st President of the United States. A number of social media users claimed, however, that President Trump failed to do the same. Idiot Trump refused to place his hand on his heart while saying goodbye to President George H. W. Bush like everyone else in the room. I don’t blame Trump. He has no heart. So nobody gonna talk about how Trump the only one without his hand over his heart? These screenshots are all genuine. At one point during the funeral, as George H.W. Bush’s casket was borne into the cathedral, President Trump did not have his hand placed over his heart while several other politicians did. However, that wasn’t the entire story. President Trump had his hand over his heart as George H.W. Bush’s casket passed his pew. He dropped his hand shortly afterward, however, while many (but not all) of the other government officials and civilians in the front row kept their hands over their hearts until the casket was at rest. President Trump then also placed his hand over his heart as the casket was carried out of the cathedral at the conclusion of the services. 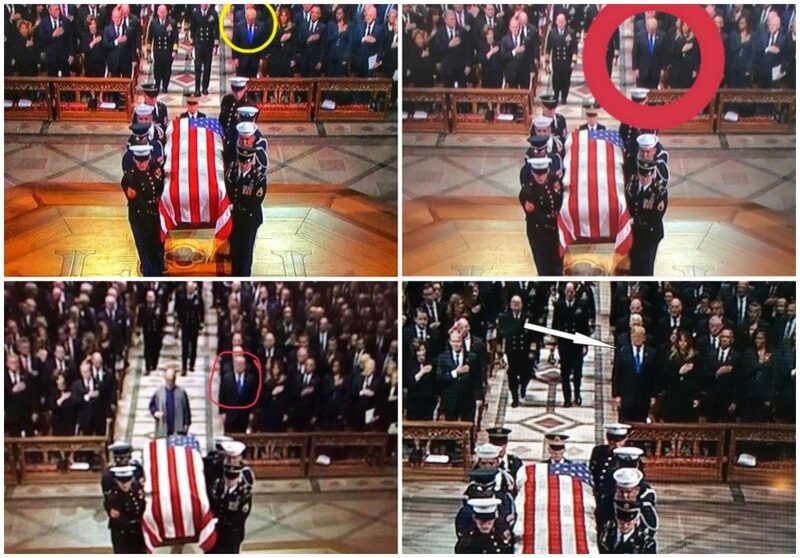 Although screenshots showing President Trump with his hands at his side during the funeral are genuine, claims holding that Trump “failed” to put his hand over his heart, that he “disrespected” George H.W. Bush, or that he was the “only person” not to perform the gesture are misleading (if not entirely inaccurate). This criticism is also largely based on the notion that government officials and civilians are expected to place their hands over their hearts during certain moments of a state funeral. We spoke to a former government official involved in protocol about the issue, who told us that although former presidents and other civilians might engage in the hand-over-heart gesture as a casket passes by, that symbolic action is directed at the U.S. flag draped over the casket and not at the deceased. We examined videos of the funerals for President Gerald Ford and President Ronald Reagan and likewise found that although many attendees held their hands over their hearts as the caskets entered and exited the cathedral, the gesture was not unanimously employed.